The BMW OHV V8 engine was the first V8 engine made by BMW, produced from 1954 to 1965, it was designed by Alfred Böning. This engine is usually named by the fact that it was the only pushrod-driven overhead valve V8 ever produced by BMW. All subsequent BMW V8 engines would usedouble overhead camshafts as well as fuel injection, but the development of the next V8 engine by BMW would not take place for more than three and a half decades. The BMW 501 was a larger and heavier car than BMW had ever made before when it premiered in 1952, and it was the first BMW car made in West Germany after a long hiatus after World War II. However, it was powered with an elderly straight-6 from before the war, and though power was increased to 65 horsepower (48 kW), it was a sluggish performer. Their primary competitor,Mercedes-Benz, fielded the W187 in the same class but with superior performance. In order to reassert their status as the producer of sporty sedans, BMW debuted a 501 with a pushrod V8 engine. This was called the BMW 502. This V8 engine was available in 2.6 L (157 in3) and 3.2 L (193 in3) form. The engine was an aluminum alloy, longitudinally-mounted 90° V8. The original version had a 74.0 millimetres (2.91 in) bore and a 75.0 millimetres (2.95 in) stroke, giving a displacement of 2,580 cubic centimetres (157 cu in) and a power output of 100 horsepower (75 kW) with a two barrel Solex carburettor. A larger version was introduced in 1955; the bore was increased to 82.0 millimetres (3.23 in), resulting in a 3,168 cubic centimetres (193.3 cu in) displacement. The larger engine initially produced 120 horsepower (89 kW), but was later available in higher states of tune with power ratings up to 160 hp (120 kW). 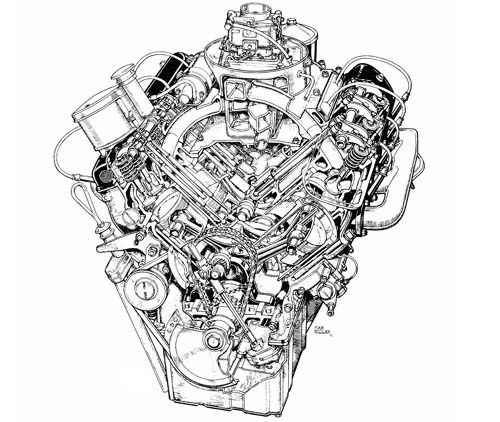 Commonly fed through Zenith carburettors, the engine was good for 5900-6500 rpm in its various configurations. The original 2.6 L version of the engine was developed for the BMW 502 and was introduced with it in 1954. A detuned version of the 2.6 L engine was available in the 501 V8 of 1955. The 3.2 L engine was developed in 1956, and was offered in the 502 from that year on. It was initially rated at 120 hp (89 kW), but ultimately was upgraded and produced up to 160 hp (120 kW) in the 3200S version. The 501/502 range was discontinued in 1964. The BMW 503 was offered from May 1956 to March 1959, during which time it used the 3.2 L engine. In this form, it produced 140 horsepower (100 kW). Mated to a four-speed manual, the relatively heavy grand tourer achieved 0-100 kilometres per hour (62 mph) in about 12 seconds and a top speed of around 120 miles per hour (190 km/h). The iconic and extremely expensive BMW 507 roadster, produced from 1956 to 1959, was offered with the 3.2 L engine producing 150 horsepower (110 kW), with a more tuned 160 horsepower (120 kW) version available. With more power and a lighter body, the 507's performance was fairly good, with 0-60 mph achieved in under 10 seconds and a top speed, depending on gearing, of 141 miles per hour (227 km/h). However, the car's stratospherically high price made it extremely exclusive and almost ruined the company due to the cost of production and slow sales. In its final incarnation, the 3.2 L engine powered the 3200 CS. The engine produced 160 horsepower (120 kW). When this vehicle was taken off the market in 1965, it was the end of an era for BMW, as changing market trends such as the successful BMW New Class positioned it downmarket, and left the company with little interest in low-volume exclusive coupés. Furthermore, with the final production run of this engine, no V8 engines would power any BMWs until 1991 with the BMW 840i. Frazer-Nash, which had been an importer of BMW cars into the United Kingdom, used the BMW V8 in a limited run of cars named Continental. Due to financial troubles, Talbot-Lago ceased production of engines of their own design, and instead relied on BMW V8 engines. Last updated on 20 August 2013 at 02:27.